Recent reports from different sources suggests that the messaging platform WhatsApp has been testing new text formatting options to further improve the platform. 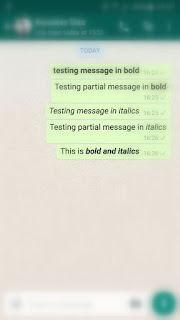 A new beta release of WhatsApp (2.12.535) featured some basic text formatting options including bold and italics. While the beta release is not recommended for normal usage, you can still try it out for fun. Users can expect a new text formatting update from Whatsapp soon. On the beta version, users have to just place an asterisk (*) at the starting and ending of a word to make it appear bold. For italics, the process is similar but you have to place an underscore (_) in place of asterisk. While there is no confirmation if the messaging app plans to integrate other formatting options, adding other options like underlines and font will surely enhance texting experience.